Start taking classes at Healthy Changes Pilates and other studios! 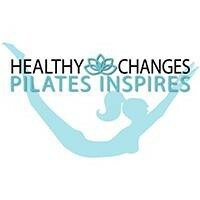 Healthy Changes wants you to be inspired by Pilates. Feel strong, feel empowered and love your workout! Based on Joseph Pilates original work, you will gain body awareness and go deeper into each exercise working with precision and control. Classes are small up to 6 students to ensure proper form and maximum results in your sessions. Please wear comfortable workout clothes and wear socks to class. Grippy socks are recommended and can be purchased at the studio. Located behind Bunratty's Irish Pub and Northern Bank. Parking is avl in back lot next to CVS. From North: Take 95S to exit 40 (MA-129W). Follow rotary sign for 129 toward Reading/Wilmington. Turn Left onto Main St & 1st Right onto Woburn St. From South:take 95N to exit 38B, merge onto Main St/ 28N toward Reading. Follow thru downtown. Turn Left onto Woburn St. At the corner of Woburn & Main St. is Venetian Moon as a landmark. Take the first left on Woburn St. Look straight ahead. Elaine is great with anatomy and movement, and has a great humor! Tower is a really great class! Erika is amazing and very hands on. Very informative and great for strength and alignment. Elaine is wonderful! Has such a great way of explaining things. Excellent visuals and mind-body cues. I was challenged, but with her help was really able to dig deeper! Erika is a fabulous instructor! Her cueing makes sense and I am feeling stronger with each class!!! Elaine is incredible! Super high energy and encouraging!